Today, I saw a student for counselling. He had some family issues and there was an unpleasant episode taking place recently. He was so downcast. I could not do much for him except to listen and to go through some coping skills with him to help him cope better. My heart broke when I heard of his family situation. I could not imagine the pain and the fear that he is going through. It broke my heart that he had to experience such unpleasant situations at a tender age. 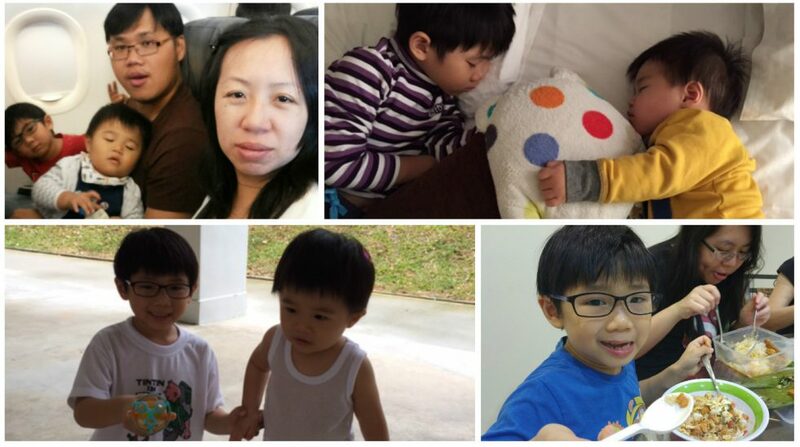 Anyway, I just encouraged him to focus on his exams and studies and other thing there were within his control like friendships and CCA since there was nothing much he could do about the situation. Later in the day, I saw him with his classmates. 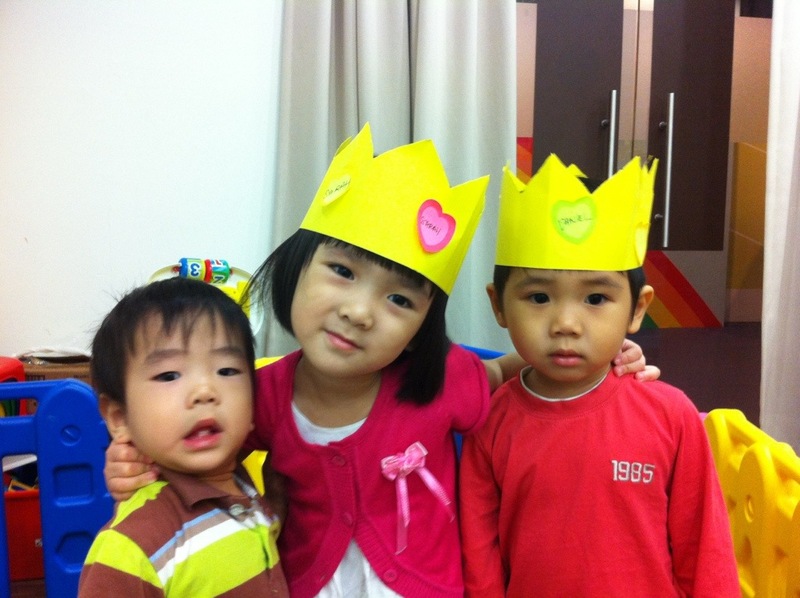 He had such a bright smile as he was having fun with his friends in class after school. I wish I could capture that smile on camera. The smile meant so much to me – that this boy was still able to smile despite what was happening in his life. That smile was so precious to me and I wished that he could always be happy and smiling. I am glad that in the midst of the storm he is in, he still does have moments of joy in his life. I am not a fan of the DENTIST and never planned for Daniel to visit one at such a young age. Had a harrowing fright one night a few weeks back. Daniel had been complaining of pain on his tongue for a few days. We thought it was just ulcers. Then, his breath started to stink and we still thought it was ulcers. He started getting fussy and refused to eat complaining of pain. Only then did we realise it was actually his teeth. His gums looked really bad and there were ulcers. 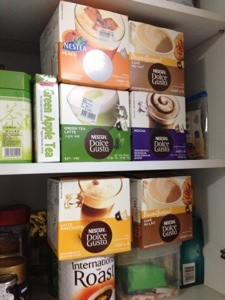 I was really freaking out…. 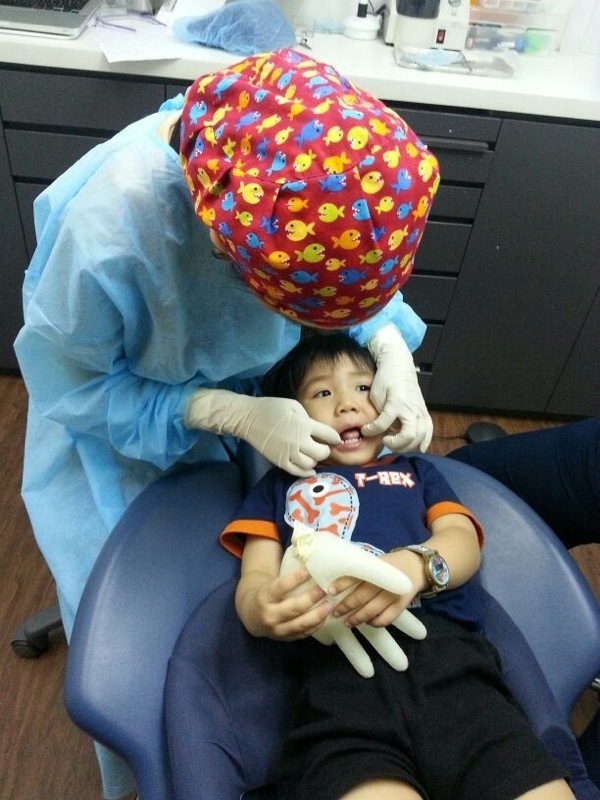 Started imagining the worst…poor boy having to go for surgery and losing his first teeth prematurely. Brought him to the doctor first thing the next day. Thankfully, it was just gingivitis and the PD put him on a course of anti-biotics. She looked shocked to hear he does not brush teeth regularly. Daniel hates brushing teeth, as a result both daddy and mummy were too lazy to battle with him tot stick a toothbrush in his mouth. At the back of my mind, guess I didn’t see brushing teeth as being important as I only remember brushing my teeth when I started primary school.hence it became a neglected routine. Until this happened. 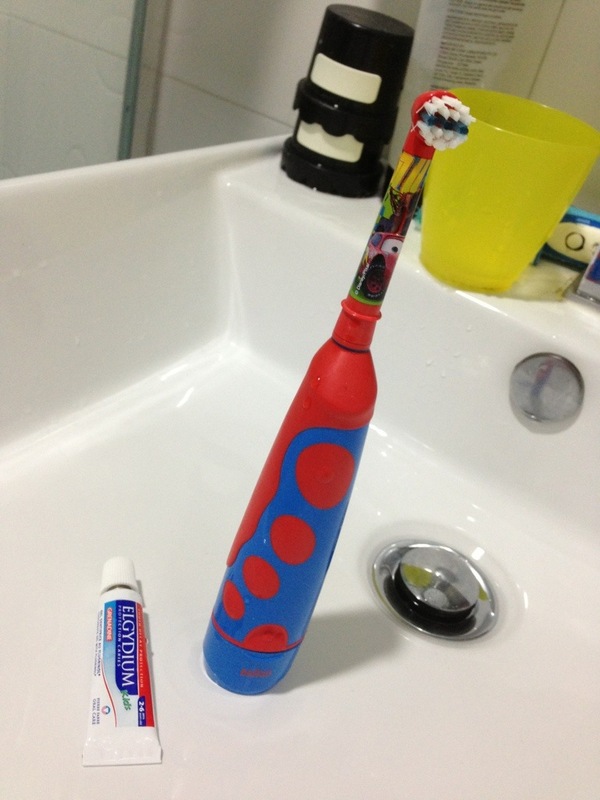 Thus started a painful process of getting the boy to brush his teeth day and night. Even got him a electric toothbrush to make our job easier. 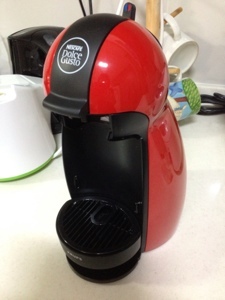 He wanted one as we are both electric toothbrush users. And that brought us to the visit to the dentist today. Was quite a pleasant experience, though expensive! The dentist used strawberry flavoured stuff to polish his teeth. And he was generally quite cooperative. After that, she gave him some stickers to reward him for being a good boy. 10 min only but it costs as much as our own regular visit. But I certainly felt quite encouraged when when she said we had done a good job with the brushing, since his gingivitis, we have been very diligent to brush his teeth twice a day even if it meant lots of tears and struggles! Spent a short and pleasant Tuesday evening at the beach. 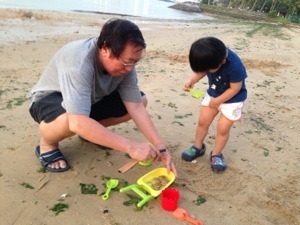 When we arrived back at my parents place this evening, Daniel excitedly said that he wanted to go to the beach….he and my dad had been waiting for us to come back to go to the beach. 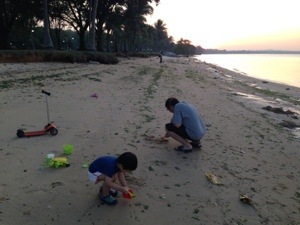 So we grabbed his beach toys and drove to Pasir Ris beach. Ivan went jogging while my dad and Daniel played with the sand. As he would usually do, my dad started digging for crabs. 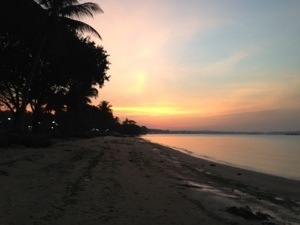 Me … I was just lazily admiring the sunset. 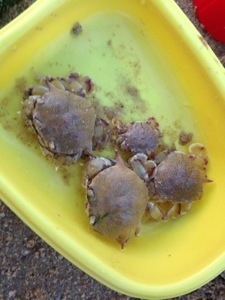 My dad found a few small crabs, as usual. 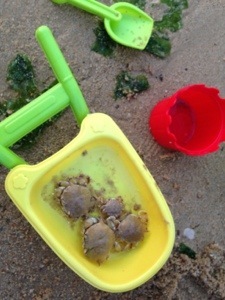 There was also a couple with young kids digging for crabs. A while later, when they were leaving, they came over and passed their catch to us to ‘play’ with as they were leaving. Their crabs were not the usual ones that my dad usually finds. Theirs were much bigger! Of course, not as big as the ones we eat, but definitely bigger. We wowed over them and started taking photos. Daniel was of course excited! All too soon, it was time to leave. My dad released the crabs back into the sea and we headed back to the car. Was a fun day for Daniel. 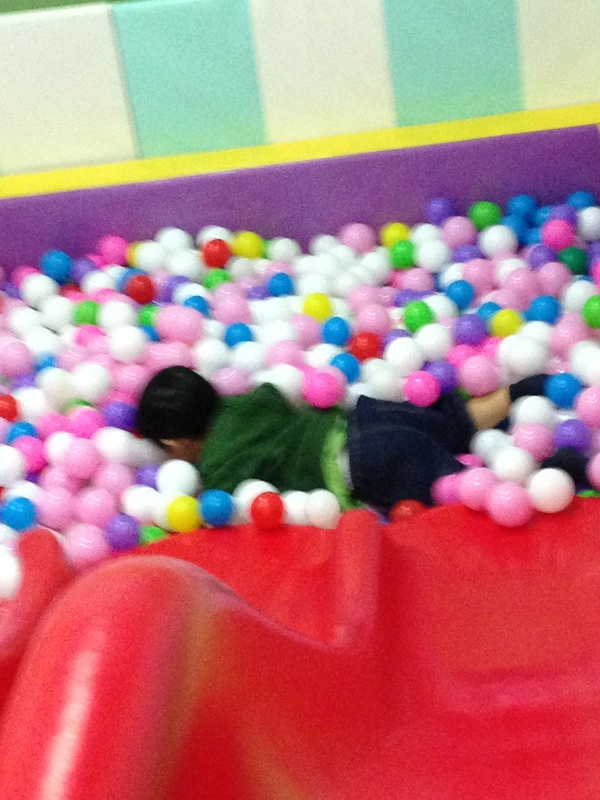 He spent a good part of his waking hours at the indoor playground KidzGo at Tampines 1 today. It was an unusual Sunday as we had gone for Saturday service this week. 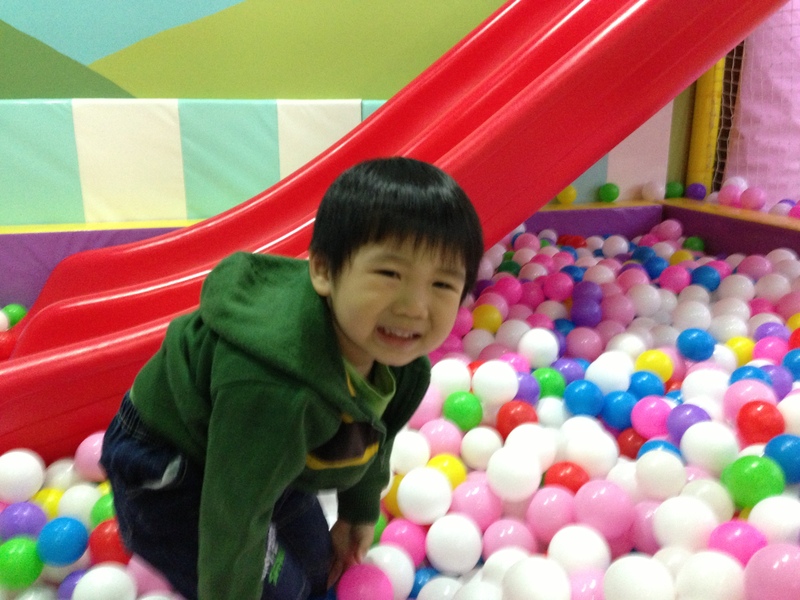 I had purchased a groupon deal for multiple entry to KidzGo. 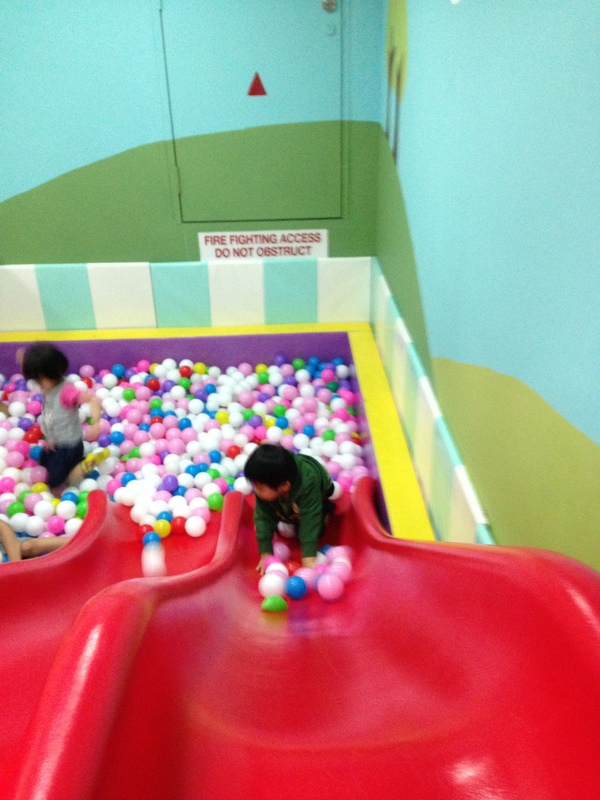 After brunch, we headed to the indoor playground. 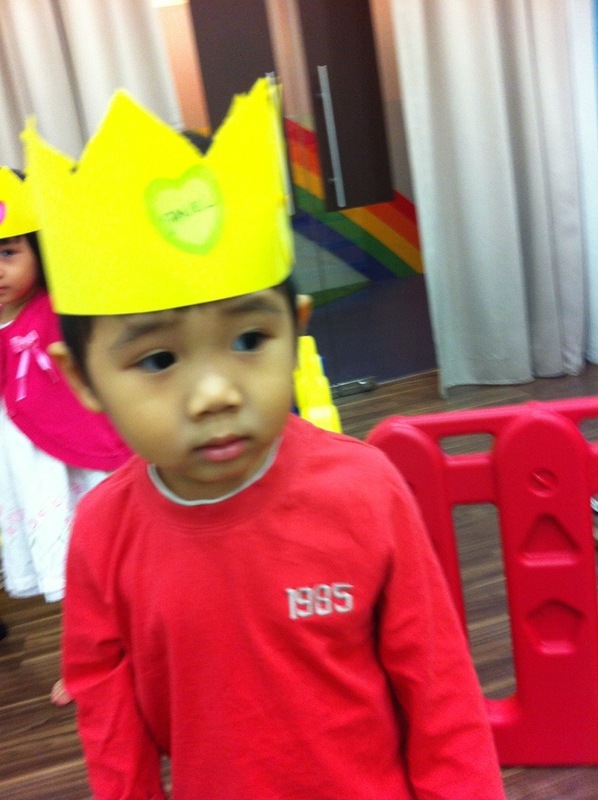 For the ‘morning shift’, I played with Daniel while Ivan went to walk around the malls. Daniel played for almost 2 hours till it was his naptime. I made him try almost everything at the playground including the toys. We went back for the afternoon for Daniel’s nap and some chores. By 6, we were back at Tampines 1 again. Had a lovely dinner at Sushi Tei and then headed Kizgro again where Daniel spent another hour and a half there. This time, it was my turn to go shopping while Ivan played with Daniel and supervised him. 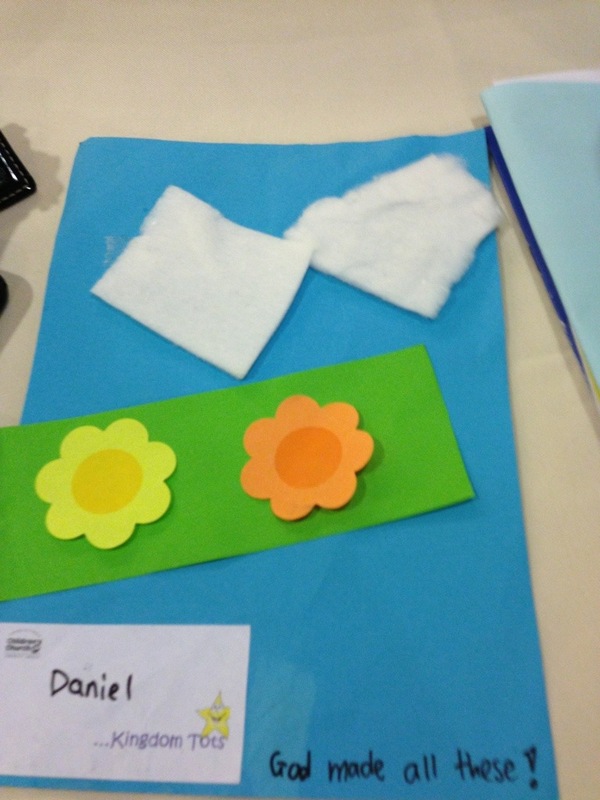 Just want to remember Daniel’s first few pieces of craft done during Sunday School lesson.